Herbert Hoover went to his grave in 1964 adamant that the actions he took on July 28, 1932 were morally defensible. That day he sent hundreds of soldiers, cavalry and some old First World War tanks to clear out the "Bonus Army" from Washington, D.C., a ragtag group mostly made up of army veterans demanding bonuses due to them in 1945 be paid immediately, understandable given the ravaging effects of the Great Depression. Instead of money, the protestors were greeted with tear gas, cavalry charges, beatings and bullets. Hoover believed that the Bonus Army weren't First World War veterans asking for charity but communists determined to bring down the American government. 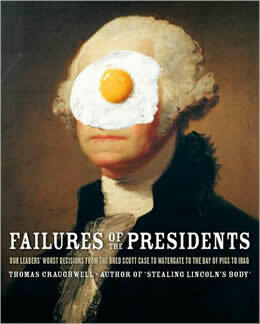 That incident and 19 others are explored in Thomas J. Craughwell's Failures of the Presidents: From the Whiskey Rebellion and War of 1812 to the Bay of Pigs and War in Iraq, an interesting romp through the less nobler side of American foreign policy and history. Craughwell spares no punches, taking on everyone from the sainted George Washington, Thomas Jefferson and Ronald Reagan to the less heralded which includes Franklin Pierce, Richard Nixon, Hoover and Jimmy Carter. Craughwell opens the book examining Washington's response to the Whiskey Rebellion, which saw frontiersman violently oppose taxation designed to pay off the crippling debt spawned by the War for Independence. From there he moves to John Adams' Aliens and Sedition Acts, Jefferson's Embargo Acts, the Trail of Tears, and the repeal of the Missouri Compromise. Failures of the Presidents also casts its eye on more modern events such as the internment of Japanese-Americans, the Bay of Pigs, Watergate, the Iranian hostage crisis, Carter's "malaise" speech, Iran-Contra and War in Iraq. Part of the fun with a book like Failures of the Presidents is debating whether Craughwell's choices really are mistakes. William McKinley's capture of the Philippines, for example, was relatively cheap in terms of money and lives – or at least as "inexpensive" as these things can be. It gave the United States an important base in the Pacific which helped check Japanese aggression, not to mention that two countries enjoy a close friendship which lasts to this day. Was the War of 1812 really in error given the continued belligerence that the United States suffered at the hands of Britain? With the successes in Iraq since George W. Bush's "surge", is that war a failure? While Failures of the Presidents generally remains unbiased – presidents of all political stripes are exposed – Craughwell does occasionally let slip with some political statements including bemoaning the lack of universal health care and determining the nuclear strikes on Hiroshima and Nagasaki to be militarily unnecessarily. He also apparently has a blind spot for the Clinton era as none of his numerous gaffes – failing to capture Osama bin Laden, a tepid response to repeated terrorist attacks, lying under oath during the Jones-Lewinsky scandal, among others – failed to make the grade. It was likely a deliberate choice but it's odd that Craughwell never analyzes his examples in an attempt to introduce alternative choices for the presidents to have made. Labeling Washington's response to the Whiskey Rebellion, for example, as a failure is fine but what should have America's first president had done instead given the dire need for revenue? And with the Viet Cong using Cambodia as a supply route for their military campaign in South Vietnam, what choice did Richard Nixon have but to bomb their bases and supply lines? Despite these concerns Failures of the Presidents is still an enjoyable and interesting look at American history which generally remains evenhanded and avoids the "Blame America First" attitude that typically plagues these efforts. Hopefully it will prompt readers to question some of their assumptions and take a more critical look at both historical events and the people responsible for them, even if those presidents are loved or loathed. Steven Martinovich is a freelance writer in Sudbury, Ontario, Canada and editor of Enter Stage Right.